Established in Australia over fifty years ago, Ramset has built a strong and enviable reputation for developing, manufacturing and supplying the building and construction industry with leading edge drilling, anchoring and fixing products. 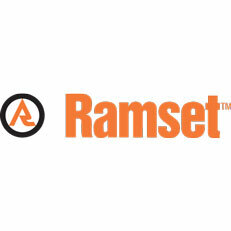 The Ramset comprehensive range includes: Powder and Gas Actuated Fastening Systems Power Tools Chemical Anchoring Construction Chemicals Fire Protection Systems Mechanical Anchoring and Screws Cable, Pipe and Conduit Fixing Systems Ramset prides itself in its commitment to quality and its position as a motivated and progressive company dedicated to the highest standards. Products are tested to provide safety and confidence, this is supported by detailed technical information which meets the relevant industry requirements. Ramset is a certified supplier in accordance with ISO9001:2008. Service, support, delivery and innovation all lead to customer satisfaction. This simple philosophy has become a powerful tool in keeping Ramset at the forefront of the building and construction industry.